So, what is bokeh and why the heck should you care about the definition of bokeh? It has become one of the buzz words with portraits and photography in general. 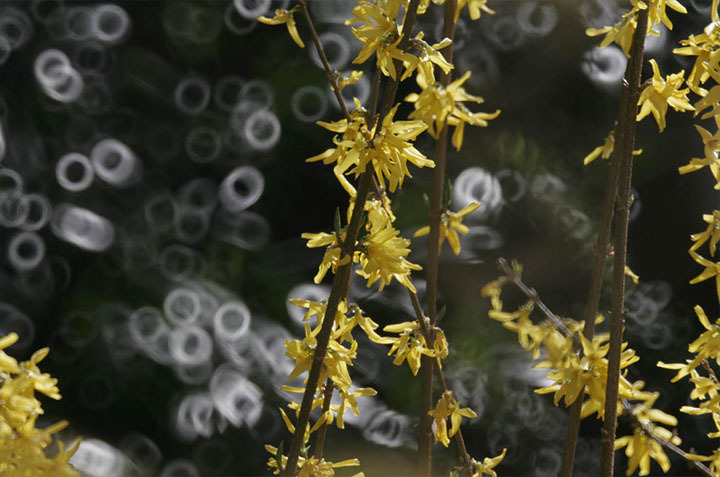 The definition of bokeh comes from our Japanese friends and roughly means "blur" or "haze." Mike Johnston, the former editor of Photo Techniques Magazine is credited for giving us it's English spelling in the late 1990's. 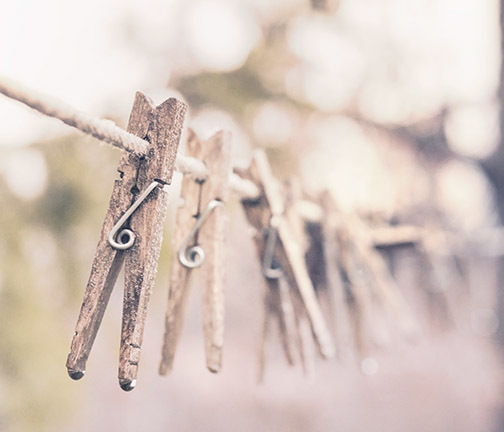 Bokeh refers to the QUALITY of the out-of-focus parts of your photo-not the amount of blur. Bokeh is the way a lens renders out-of-focus parts of your photograph, usually in the background behind your subject. Bokeh can be unappealing or pleasant. Sometimes people mistakenly talk about how much bokeh they want, but what they really mean is how much blur they want. Bokeh isn't about the blur itself. It’s about the quality of that blur and how it show up. Generally, if you get more blur in the background, your subject will stand out better. You can get more by using settings that give you narrow depth of field. Check out the photo below. I know it's not an award winner, but stay with me here for a second. 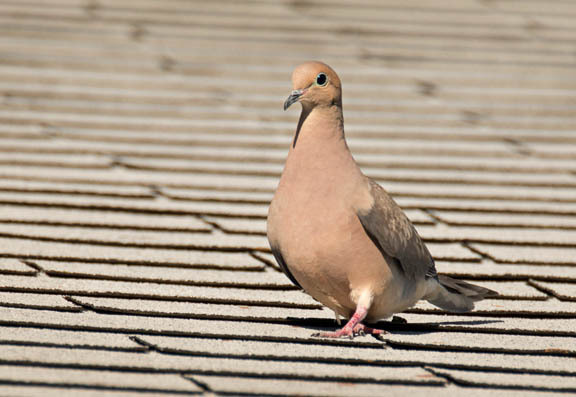 Backgrounds like this shingled roof in the photo below are generally unattractive. If a camera lens can give you good bokeh it makes the background less harsh and somewhat pleasing. Example of Bokeh with a powerful telephoto zoom at f/8. Longer telephoto lenses and wide open apertures will give you more shallow depth of field and can give you good bokeh, depending on the quality and arrangement of the lens elements and how the diaphragm is constructed. Here are some more examples of depth of field and links to shallow and deep depth of field posts. Some lenses give you naturally good bokeh that is desirable while others produce blurring that is not very pleasant and can be distracting to your subject, called bad bokeh. 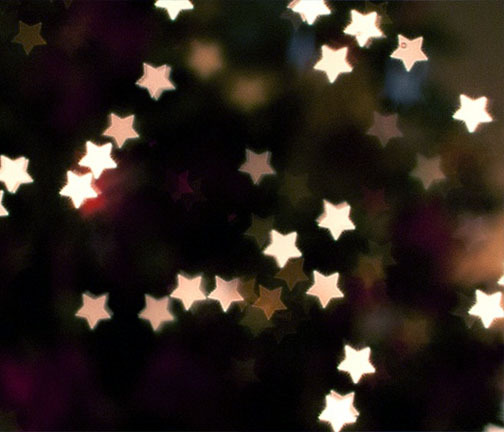 You can also do some creative do-it-yourself bokeh effects using simple materials. You can control the shape of the out of focus highlights in the background of your photo. 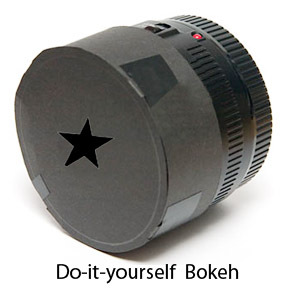 The bokeh lens device shown here, made with black paper would produce star-shaped highlights. The shape of the diaphragm and the number of diaphragm blades in the lens affects the shape of the bokeh highlights. Understanding what is bokeh and the different ways to control it can improve your ability to turn a good photo into a great photo. 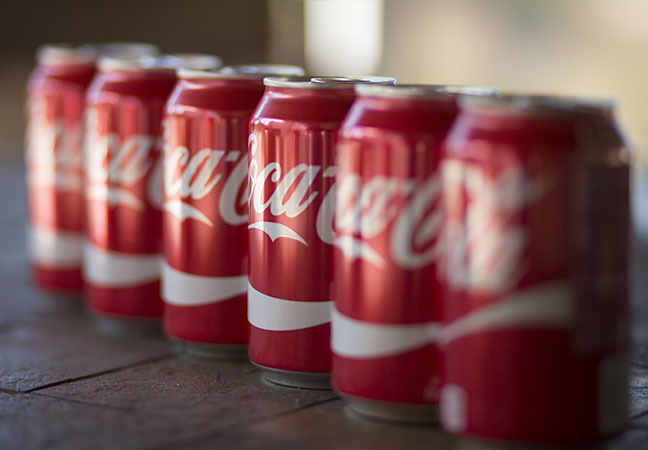 There are several factors that affect bokeh. In addition to how long a lens is (telephoto strength) and how wide it can open (maximum aperture), the third major factor in getting good bokeh and shallow depth of field is sensor size. Very small sensors such as those in cell phones and compact point and shoot cameras give too large of a depth of field to get a very good Bokeh effect. Digital cameras with full-frame sensors will give you the shallowest depth of field and also the best Bokeh effect. Yes, another way to get a somewhat artificial Bokeh effect is to add blur if you do your own photo editing. You can use software on your smart phone or on your computer. Gaussian blur is a filter that is commonly used in Photoshop, but there are several ways to get bokeh with Photoshop and Lightroom. One advantage of Gaussian blur is you can change the amount and direction of the blur several different ways to see which you like the best on the same photograph. You can also use "Portrait Mode" or "Bokeh Mode" or certain iPhones and smartphones. Additionally, there are free apps and paid apps that you can download to your phone for a few dollars. Here is an example of the kind of good bokeh you can get naturally with macro photography. The depth of field is so shallow that even things that are only a slight distance behind the subject are pleasantly out of focus. Sometimes it's the exact angle. 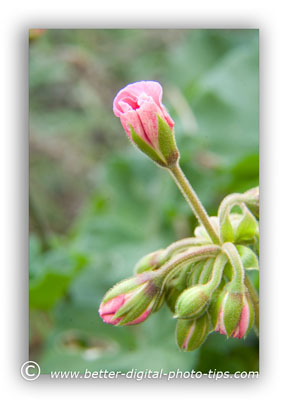 This is a photo of a budding Geranium. 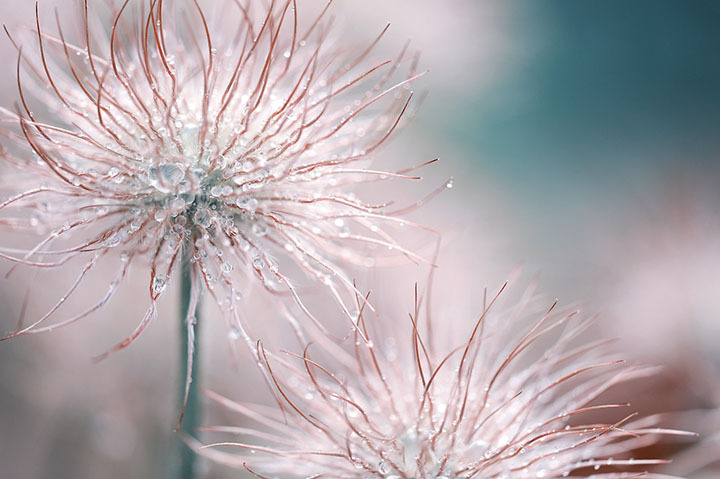 Close-ups of flowers are a good opportunity to get familiar with bokeh and get to study the effect of a blurry background on isolating your subject. A good example of bad bokeh is produced when you use a mirror lens. Mirror lenses produce a ring-shaped highlight that is distracting as a background. Mirror lenses produce bokeh with ring shaped highlights because they have a mirror centered in the middle of the front of the lens. It blocks the light from entering through the center of the lens and gives you a donut-shaped highlight. They were popular back in the day because you're getting a lens with a powerful long focal length designed to fit in a small package. which lens gives the best bokeh? So, you know you'd like to get that soft, creamy look of attractive bokeh in some of your photos to contrast with the sharpness of your subject. 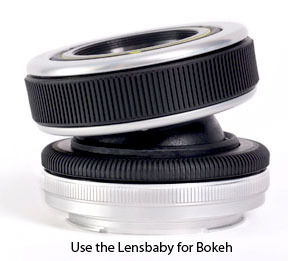 Now you want to know what's a good lens to use for getting nice bokeh. Generally speaking, lenses that are fast, are prime lenses, and are telephoto, will give you the best bokeh. A fast lens is one that has a large aperture to achieve that shallow depth of field we talked about. 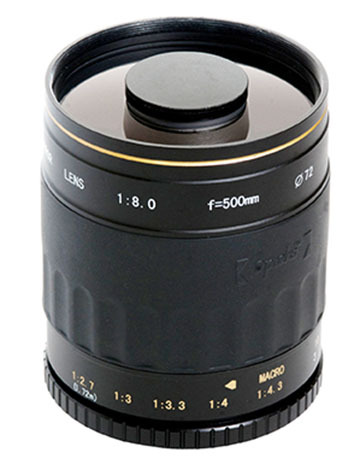 Fast lenses have maximum aperture of f/4.0, f/2.8, or wider. Prime lenses are lenses that have a fixed focal length-they don't zoom. Longer telephoto lenses give you more of an out of focus background. Can you get good bokeh without using a fast prime telephoto lens? Yes, but one of using one of these lenses makes it easier. What's the bottom line? No matter how you produce it, Bokeh is subjective. The out of focu portion of your background will either enhance, detract, or have little effect on your main subject. It's your interpretation, as the creative photographer that matters. You may not like the contrived shaped bokeh techniques, but your sister will. Whether you experiment with different lenses and camera settings, you use a filter on your phone, or you use computer software afterwards, your understanding of what bokeh is and your awareness of good or bad bokeh, more than anything, will be what counts. You can create a good bokeh effect (but not exactly the same) by using specialty lenses such as the extremely popular LensBaby. Using the Lensbaby is very simple because you do it at the time of exposure. Its effect is permanent for each photograph you take, unlike software where you could try a few versions on your original photo.